Gambia UNC complete set of the Specimen banknotes. 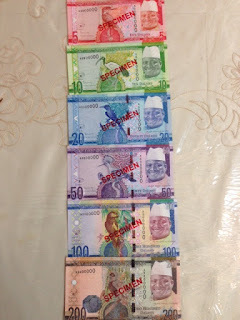 The banknotes are an addition to the new family of the Gambian Dalasis and an introduction of 200 Dalasis banknote. The Central Bank of the Gambia ( CBG) introduced into circulation a new family of paper-base Gambian banknotes for all other denominations except the D25.00 which will be replaced by the D20.00 note. These notes will include a New D200.00 denomination. A fundamental distinction is that all the notes are smaller in size and all of them bear the portrait of the President. This new family of banknotes currently circulated nationwide along with the existing banknote family of D100.00, D50.00, D25.00, D10.00 and D5.00 until these are fully withdrawn over time.